My latest PopMatters article is now live: Finding Meaning in The Road and The Last of Us. 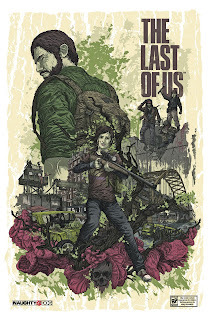 A couple notes on The Last of Us before going on a bit of a tangent. First, I don't discuss the interactivity in The Last of Us at all in this post, but I want to make clear that several design elements support the game's themes. The severe resource limitation, couple with a crafting system, convey a sense of desperation and desolation remarkably well, even while in the heat of battle. There's a moment in the game where Ellie comments on a poster of a thin model, stating how weird it is that some would starve themselves for beauty in a world of plenty. The two components nicely relate to apocalyptic storytelling practice of stripping the world down to component pieces to criticize our way of life, or at least make us thankful for it. Second, I really like this game. The scripted narrative moments are often couple strategically with similarly toned mechanical segments, so high-tense set pieces are book-ended with intense or cathartic story beats. It's really smart storytelling that Naughty Dog has crafted for some time. Now for a quick tangent. I'm a huge Cormac McCarthy fan, so I was thrilled to see the numerous connections between The Road and The Last of Us. That being said, I think The Road is one of his weaker novels. McCarthy asks readers a lot of questions, but with such an overbearing gloom that pervades the novel, it's hard to get at any clear messages or answers. Of course a deep sense of depression in his work is common, but The Road stands out to me as a weaker exploration of modern America. By far his best work, and one of my favorite novels of all time, is Blood Meridian, a terrifying look into the foundations of American mythology, modern politics, storytelling, religion, capitalism, and so much more. It is a quintessentially "American" novel, and a Western novel at that, and it commits to plumbing the source of the "American rot" found in all of his novels. I say this only because while I really enjoy The Last of Us, I'm quickly growing tired quiet explorations of themes. I want a Blood Meridian video game already.